Private 1/2 Acre Property with 1 King Bedroom/1 Bathroom, close to the beach. The MauiJOY Guest Suite is a 1Bedroom/1Bathroom private area on .5 Acre estate. It has a Private Garden path entrance, living room/kitchenette, and covered lanai dining area adjacent to your own private swimming pool. The views are fantastic from the West Maui Mountains, across the ocean to the islands of Lanai'i, Kahoolawe, Molokini Crater and up through undeveloped land to Haleakala. There is a king sized comfy bed in a large bedroom, a bathroom with shower/bath, washer/dryer, 40' Smart Flat Screen TV, free movies, dishes, premium linens, luxury bathrobes, beach chairs/towels and Free Wifi provided for our guests. We can add a single futon or baby Travel Evanflo Deluxe Suite Koi that can be used as a crib or rolling play pen. There are beautiful ocean views from the living and dining/kitchen area. Sit by your private pool, enjoy your morning coffee, and watch the whales. This has been a favorite for families with younger children who can swim while closely monitored, and saves money too. Look at the reviews on Property 3864466. To avoid confustion we seperated the two rental areas. Only one party at a time will be here so you will have the pool to yourselves and it's clothing optional! Located above Wailea in Maui Meadows at it's Southern border, adjacent to thousands of undeveloped acres, the MauiJOY Guest Suite has breathtaking views of the ocean and night skies. Lush tropical landscaping affords property privacy. The lower garden, also with ocean views, is a perfect meditation or yoga spot. There are also various organic fruit trees with Mango, Papaya, Guava, Strawberry Guava, Tangerines, Oranges and Passion fruit vines for your morning smoothies. Many house guest have called this 'Heaven on Earth' and we are so grateful to be here on Maui No Ka Oi. We, (MauiJOY and staff) invite you to spend your time with us to relax, rejuvenate, and enjoy our sanctuary. I purchased this home because of it's ocean views and location away from everything yet close enough to get to it all (Resorts, golf, restaurants, shopping including the best beaches in the world in about 3 minutes by car.) The views are probably the best in the area as the location is on the edge of the neighborhood with thousands of acres of vacant land adjacent to the lower gardens. It's quiet, with peaceful tranquility and neighbors who are use to this peace and quiet and Maui County noise ordinances are very strict. No noise after 9PM to 8AM. Would you like to pamper yourselves with a private chef, massages poolside, aromatherapy, 10-day detoxing, private consierge services? Happy to arrange for a private boat (whale watch), concert tickets and will do our best to help to create the vacation you have painted in your mind and heart. 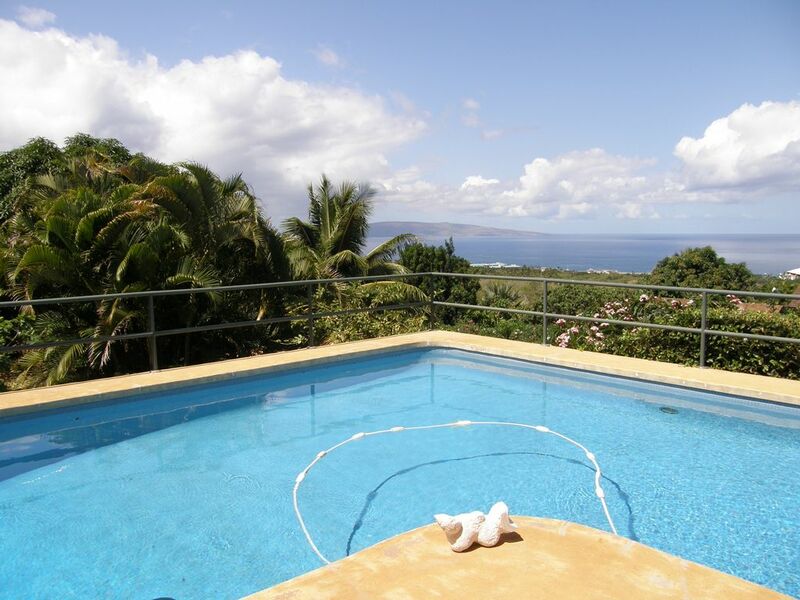 You may not want to leave the MauiJOY Guest Suite as the large swimming pool overlooks the vast ocean from the West Maui Mountains, across to the island of Lana'i, Molokini Crater, Kahoolawe and up to Haleakala. There are few street lights in this area providing the most amazing views of the vast night sky. The views of the Milky Way are brilliant! I use my I-Pad night sky app as we can see and learn so much about our universe. The full moon reflecting in the pool provides romantic lighting while the fragrant flowers fill the air with their perfume. Yes, this is paradise and it can be yours. toilet, combination tub/shower, Very clean with a small window above the shower/tub. The linen cabinet is stocked with fresh towels, hairdryer, sewing kit, first aid kit etc. A flip top toddler insert available for the toilet. MauiJOY Villa is your mini resort, within a 3 minute drive downhill to the the resorts of Wailea, The Four Season's Resort, The Grand Wailea, Andaz Wailea and Marriott Wailea. Expansive views of the verdant hills all the way up to the top of Haleakala. Spectacular morning sunrises over the volcano, view the Milky Way in the night sky, sunset watch the mountain light up. Unobstructed 180 degree ocean views that includes the islands of Lana'i, Kahoolawae, and Molokini Crater. Since we are on a hill and bordering thousands of undeveloped acres, you can see forever. Enjoy the panoramic water views from nealy every room, from the swimming pool, and private lower gardens. YES, The MauiJOY Guest Suite is fully Air-Conditioned! The best quality linens for our guests. A full sized stackable washer and dryer. There are bath towels, pool towels and beach towels. Located on the lanai with ocean views where you can work out with weights and a bench. Large Toaster/Oven Big enough for pizza and baking. The latest greatest Vitamixer for your fresh fruit smoothies. Everything you need to create fabulous meals. If you need something and we don't have it, we'll get it. Vitamixer for those smoothies from the fruit on our trees. Everything you need to create fabulous meals. The latest Duxtop Induction Cooktop with it's own cookware. New Kitchen Aid barbecue with extra side burner steps from the kitchen with outdoor lighting. Covered area Al fresco (outside is best), by the pool or there is a small table for 2 inside. 40" Samsung Smart TV with free movies/Netflix and Amazon Prime. There are plenty of books and some excellent childrens books too. There are board games and card games for the entire family. Lush tropical organic landscaping with organic fruits of mango, figs, guava, tangerines, oranges, fresh herbs and organic cherry tomatoes. Can rent just down the hill. This is a steep hill so you need to be in shape to ride here. We call the deck/patio the Lanai in Hawaii. Part of the lanai is covered where we have an additional twin bed to relax and read, the large table and bookshelf. There are 2 loungers poolside. We love Snorkel Bob just down the street as he has helped to save our reefs from tropic fish poachers. Within a five minute drive. Gorgeous views of the ocean from the private pool. (Ask me about clothing optional rules). We have security fencing that can be installed for the protection of our toddler guests. We so enjoyed relaxing every day and evening in the pool and covered lanai. The views were fantastic and the setting so peaceful. We woke to the sound of many birds singing and saw so many lovebirds, Java sparrows, cardinals, peace doves, and Mina birds feeding at the bird feeders and watched as they headed to their homes each evening. The sunsets were glorious and the property close to the beaches and shopping and restaurants. The property and house was clean, comfortable and relaxing! Really enjoyed the views and birds! The addition of that outdoor furniture beneath the mango tree in the lower garden is providing such a sweet place to sit and enjoy some time on one's own with serene views of Molokini Crater and the Island of Kahoolawe. This lovely Hawaiian retreat proved to be exactly what my wife and I were looking for to spend our honeymoon together! Terri was extremely kind and generous as our hostess during our stay, and made sure to give us all the privacy we wanted while always being available to share her knowledge of places to go and things to do with us. The cozy suite with its beautiful garden, private pool and close access to the beach was perfect for us. Highly recommend! You two were EXCEPTIONAL as well! It was an intense week with Hurricane Lane looming close yet we all kept our cool and you were both so sweet in helping with some of the preparations. What a JOY to have it dissipate into a tropical depression where we had beautiful light rain shower that one night. You took advantage of the waves and boogie-boarded! You have a great attitude for what you went through that I know your marriage will be very strongly bonded. I hope you will return someday. Beautiful and naturally landscaped, delightful sunset views! Wife and I came for our long delayed honeymoon and it did not disappoint. Great location overlooking Wailea with Molokini crater visible from the pool. Great restaurants almost within walking distance and the property is beautiful with a very natural and serene atmosphere. Aloha and Mahalo for your wonderful review of The MauiJOY Guest Suite. I'm delighted to hear that your honeymoon was wonderful and more than your expected. You two were go go go go go...yet managed to be here to see the sunsets and night skies, enjoy the fresh mangoes and papayas from our trees. I'm looking forward to seeing you next time with friends and or family! You are always welcome. Nice and quite location. We enjoyed our stay ! Merci for your review of The MauiJOY Guest Suite. It is always a pleasure to have our European visitors stay and learn more of the Hawaiian culture and Aloha. I hope you will return and bring the family for the larger space with the 2B/2B. Lovely property. Wonderful private pool. Crystal clear water. Everything well maintained and thought of. A private paradise. Close to great restaurants and wonderful beaches. Four Seasons Resort of Wailea, The Grand Wailea, Monkey Pod restaurant, Pita Paradise Wailea, Matteos, Fabiani's Wailea are all within a few minutes drive. Cancellation 60 days prior required for full refund less $150 booking fee. Not refundable if cancelled within the 60 day period. No refunds for leaving early. We will work with our guests if there are special circumstances and may at our discretion offer an opportunity to trade availability. MauiCounty BBKM 2014/2004.